It seems that a Mac version of Logitech's new K810 Bluetooth illuminated keyboard designed primarily for Windows 8 is out in the Canadian wild. The K811 Easy-Switch is apparently the almighty Mac model complete with what else, a Mac keyboard layout with an undeniable Apple-esque styling made to appeal to the sparkly aluminum loving Mac users. The K811 is everything the K810 is which rivals Apple's Wireless Keyboard with an even sleeker design, the power of illuminated keys and a rechargeable battery. Instead of the brushed slate finishing, the K811 features a silver aluminum body and black backlit chiclet keys. No word on the exact release date, but we're sure the K811 is right around the corner. 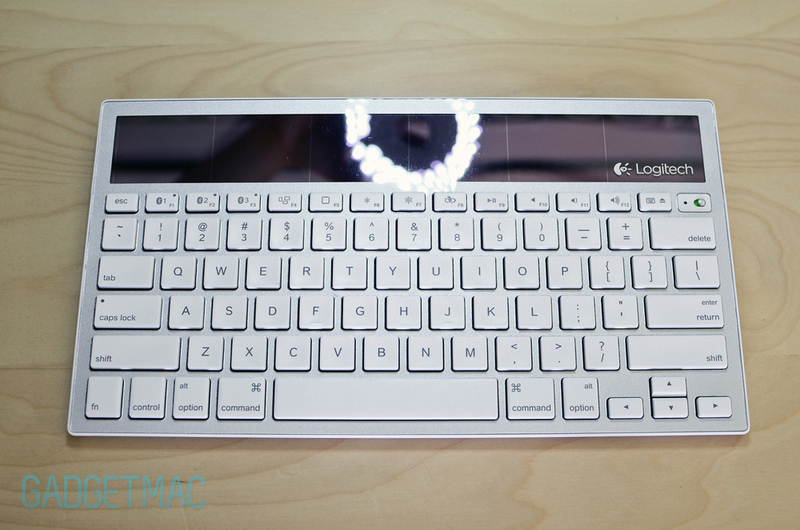 Update: Logitech has officially announced it, but it looks like it is now called the Easy-Switch Bluetooth Keyboard. It's now available for pre-order on Logitech's website for $100. Thanks for the tip, Simon! Logitech has released the G710+, a mechanical gaming keyboard with programmable back-lit keys. 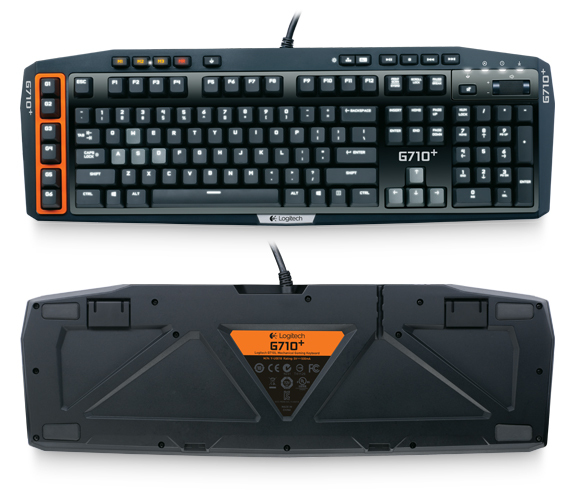 The G710+ keyboard delivers on the G-Series front with awesome game-grade, tough design and features Cherry MX Brown mechanical key switches that are optimized for rapid key entry and serve up a uber tactile, quiet gaming-grade responsive key presses without making loud clickity-clacking noise thanks to the rubber dampening underneath each key cap. For your $150 you'll also find anti-ghosting firmware, adjustable dual-zone backlighting with brightness control, a side row of 6 programmable G-keys, a removable palm rest, volume roller and loads of buttons for you to play with. Logitech's G710+ is but of course, PC-only and will begin invading retailers in the US this month while European folks will have to wait till December. Logitech was nice enough to demonstrate its new G710+ keyboard, so see it in action in the video down below! Spilling your drink all over your keyboard and having to clean all the nastiness under those keys is a nightmare to say the least. Thanks to Logitech's watchful eye, we've got a keyboard that solves those problems. Logitech has unveiled the K310, a slim washable wired keyboard that is easy to clean and dries up quickly after being dunked in water. From a light dusting to a rinse in the kitchen sink, this keyboard is submergible in up to 11 inches of water, and dries easily, thanks to its convenient drainage holes. The K310 features white laser printed keys and UV coating for prolong durability. It comes in a unique, contemporary design with a familiar layout for Windows users. Logitech is yet to make a Mac version of the K310 keyboard. Logitech's K310 keyboard can be pre-ordered starting today, and is expected to be available in the US later this month and Europe beginning in October for $40. Logitech is expending its line of solar keyboard today with its latest offering, the K760 Wireless Solar Keyboard made for Mac, iPad and iPhone. The K760 is the Bluetooth compact equivalent of Logitech's K750 Wireless Solar Keyboard, and can easily remain powered by low indoor lighting while recharging its internal battery that can last up to three months in total darkness thanks to the sensitive solar panel. Logitech's K760 Wireless Solar Keyboard features a slim, minimalist design and Mac-specific keys, including Command, Brightness, Eject and more. The unique Logitech concave key design gives you more comfortable and quiet typing, and offers more speed and precision than typing on an on-screen keyboard. With the K760's Bluetooth connectivity you'll be able to pair up to three devices at once while instantly being able to switch from one to the other with the push of a button. The K760 Solar Wireless Keyboard will only be available in silver. It's now available to pre-order at $79.99 with an early June release date. SwitchEasy is slowly but surely starting to out products not just for the iPhone and iPad, but also for the MacBook Pro and MacBook Air. SwitchEasy's new SafeKeys are silicone keyboard covers made for 2011 MacBook Air and MacBook Pro and include the updates Lion keys for Launchpad and Mission Control. The SafeKeys keep your keyboard protected from accidental liquid spills, Cheetos covered fingers and small debris and are available now in 5 different solid colors including clear for $24.99. SwitchEasy hasn't made it clear whether these silicone keyboard covers actually let the keyboard backlight shine thru or not. If $25 is a wee bit too expensive for you, check out our handy guide for the most affordable (and most likely less quality focused as opposed to the SafeKeys) keyboard covers money can buy. 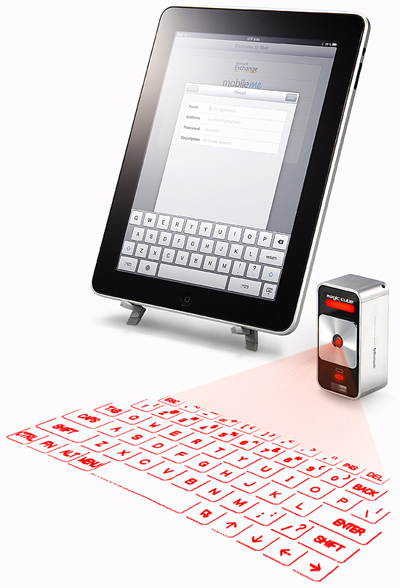 Forget about keyboard cases, this Cube Laser Virtual Keyboard made by Celluon is where it's at right now. The future is already here? I remember watching movies with this kind of technology and it was just CGI at the time. Now you can finally get the real deal. The Cube Laser Virtual Keyboard projects a full-sized red lasered keyboard onto a flat surface and will sound a clicking sound when you type. And it can connect to virtually any Bluetooth enabled device, not just the iPad and iPhone. The built-in rechargeable battery will only last for about two and a half hours of continuous typing in the dark of night. Too bad it doesn't come in other laser color choices other than the boring red color. You can grab one for $169.99 over at ThinkGeek. Where else? It's the only place you can geek yourself out. See it in action after the break! Well not really, but you get the idea. This Aluminum KeyBoard Buddy case for the iPad 2 will add a slim, black chiclet style keyboard incased inside an aluminum shell that will perfectly match your iPad 2 to create a one-of-a-kind MacBook Air-like work pad that runs iOS. Wonderful, isn't it? For $49.90, the Bluetooth enabled Aluminum KeyBoard Buddy keyboard case features a full-sized keyboard boasting a built-in, USB rechargeable battery that is said to last several weeks on a single charge. It's slim, eye catching and it won't put a dent in your bank. Too bad it doesn't have backlit keys though. The other little drawback to this keyboard case is that it doesn't have a hinged design like other keyboard cases for the iPad 2 such as the ClamCase. Head on over to M.I.C Gadget for the full review of the Aluminum KeyBoard Buddy. Catch the video right after the jump!